AMAÇ: Kadmiyuma (Cd) çevresel maruziyet hiperglisemi ve azalmış serum insülini ile ilişkilidir. Bu çalışma, Cd’ye maruz kalmış diyabetik ratlarda Lipoik Asit (LA) ve insülinin glikolitik enzimler, karaciğer marker enzimleri ve lipidler üzerindeki etkilerini değerlendirmek için tasarlanmıştır. GEREÇ VE YÖNTEM: Erkek Wistar sıçanları 7 gruba ayrıldı (n = 8). Gruplar kontrol, diyabetik kontrol, diyabet + CdCl2, diyabet + insülin, diyabet + CdCl2 + insülin, diyabet + CdCl2 + LA ve diyabet + CdCl2 + insülin + LA gruplarından oluştu. 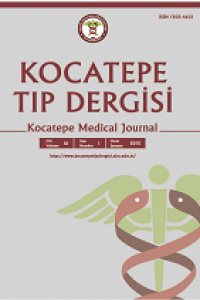 Tip 1 diyabet, 6 gruba intraperitoneal (i.p.) streptozotosin (STZ) (65 mg / kg) enjeksiyonu ile indüklendi. İnsülin (4 IU/kg/gün), insülin ile tedavi edilen gruplara subkutan (s.c.) verildi. CdCl2 (1,2 mg/kg/gün), CdCl2 ile tedavi edilen gruplara s.c. verildi. LA (100 mg/ kg/gün), LA ile tedavi edilen gruplara i.p. verildi. CdCl2 ve insülin tedavisi, intraperitoneal STZ enjeksiyonundan 2 gün sonra başlatıldı ve 3 hafta sürdürüldü. Serum glukoz, AST, ALT, ALP, BUN, LDL, HDL ve TG düzeyleri, tam kan HbA1c düzeyi ve karaciğer heksokinaz (HK), piruvat kinaz (PK) ve Na+/K+ ATPaz aktivitesi değerlendirildi. BULGULAR: Diyabetik grupta serum glukoz, HbA1c, TG, LDL, AST, ALT, ALP ve BUN düzeyleri kontrol grubuna göre daha yüksek bulundu, ancak HDL daha düşüktü. Diyabetik kontrol grubu karaciğer dokusunda Na+/K+ ATPaz, HK ve PK aktivitesi azaldı. Diabetik + CdCl2 ve Diabetik+İnsulin+CdCl2 gruplarında karaciğerde PK, HK ve Na+/K+ ATPaz aktivitesi arttı. İnsülin ve LA ile tedavi edilen gruplarda HK, PK ve Na+/K+ ATPaz aktivitelerinde diyabetik kontrol grubu ile karşılaştırıldığında artış saptandı. SONUÇ: Bu sonuçlar insülin ve LA uygulamasının Cd ve STZ’nin neden olduğu karaciğer hasarına karşı etkili bir terapötik müdahale olabileceğini düşündürmektedir. OBJECTIVE: Environmental exposure to the cadmium (Cd), is associated with hyperglycemia and reduced serum insulin. This investigation was planned to assess the effects of Lipoic Acid (LA) and insulin on glycolytic enzymes, liver marker enzymes and lipids in Cd exposed diabetic rats. MATERIAL AND METHODS: Male Wistar rats were separated into 7 groups (n=8 in each group). Groups were designed as control, diabetic control, diabetic + CdCl2, diabetic + insulin, diabetic + CdCl2 + insulin, diabetic + CdCl2 + LA, anddiabetic + CdCl2 + insulin + LA groups. Type 1 diabetes was established by intraperitoneal (i.p.) injection of streptozotocin (STZ) (65 mg/kg) into 6 groups. Insulin (4 IU/kg/day) was given subcutaneously (s.c.) to insulin treated groups. CdCl2 (1,2 mg/kg/day) was given s.c. to CdCl2 treated groups. LA (100 mg/kg/day) was given i.p. to LA treated groups. CdCl2, LA, and insulin treatment were started 2 days after intraperitoneal STZ injection and continued for 3 weeks. Serum glucose, AST, ALT, BUN, LDL, HDL, and TG levels and liver hexokinase (HK), pyruvate kinase (PK), whole blood HbA1c level, and Na+/K+ATPase activity were evaluated. RESULTS: In diabetic group, serum glucose, HbA1c, TG, LDL, AST, ALT, ALP, and BUN levels were higher than cont- rol, but HDL was lower. In liver tissue, activities of Na+/ K+ATPase, HK and PK activities were decreased in dia- betic control group. PK, HK and Na+/K+ATPase activities were increased in liver in diabetic+CdCl2 and Diabeti- c+Insulin+CdCl2 groups. An increase was determined in activities of HK, PK, and Na+/K+ATPase in insulin and LA treated groups compared with diabetic control group. CONCLUSIONS: These results suggest that application of insulin and LA could be an effective therapeutic intervention against liver injury caused by Cd and STZ. 1. Moodley K, Joseph K, Naidoo Y, Islam S, Mackraj I. Antioxidant, antidiabetic and hypolipidemic effects of Tulbaghia violacea Harv. (wild garlic) rhizome methanolic extract in a diabetic rat model. BMC Complement Altern Med 2015; 17;15:408. 2. Atangwho IJ, Yin KB, Umar MI, Ahmad M, Asmawi MZ. Vernonia amygdalina simultaneously suppresses gluconeogenesis and potentiates glucose oxidation via the pentose phosphate pathway in streptozotocin-induced diabetic rats. BMC Complement Altern Med 2014; 30;14:426. 3. Srinivasan S, Sathish G, Jayanthi M, Muthukumaran J, Muruganathan U, Ramachandran V. Ameliorating effect of eugenol on hyperglycemia by attenuating the key enzymes of glucose metabolism in streptozotocin-induced diabetic rats. Mol Cell Biochem 2014;385(1-2):159-68. 4. Treviño S, Waalkes MP, Flores Hernández JA, León-Chavez BA, Aguilar-Alonso P, Brambila E. Chronic cadmium exposure in rats produces pancreatic impairment and insulin resistance in multiple peripheral tissues. Arch Biochem Biophys 2015; 1;583:27-35. 5. Singh PK, Baxi D, Diwedi R, Ramachandran AV. Prior cadmium exposure improves glucoregulation in diabetic rats but exacerbates effects on metabolic dysregulation, oxidative stress, and hepatic and renal toxicity. Drug Chem Toxicol 2012;35(2):167-77. 6. Lobato RO, Nunes SM, Wasielesky W, Fattorini D, Regoli F, Monserrat JM, Ventura-Lima J. The role of lipoic acid in the protection against of metallic pollutant effects in the shrimp Litopenaeus vannamei (Crustacea, Decapoda). Comp Biochem Physiol A Mol Integr Physiol 2013;165(4):491-7. 7. Edwards JR, Prozialeck WC. Cadmium, diabetes and chronic kidney disease. Toxicol Appl Pharmacol. 2009; 238(3):289-93. 8. Szkudelski T, Szkudelska K, Anti-diabetic effects of resveratrol. Ann N Y Acad Sci. 2011 Jan;1215:34-9. 9. Abdulrazaq NB, Cho MM, Win NN, Zaman R, Rahman MT. Beneficial effects of ginger (Zingiber officinale) on carbohydrate metabolism in streptozotocin-induced diabetic rats. Br J Nutr 2012;108(7):1194-201. 10. Saravanan G, Ponmurugan P, S-allylcysteine Improves Streptozotocin-Induced Alterations of Blood Glucose, Liver Cytochrome P450 2E1, Plasma Antioxidant System, and Adipocytes Hormones in Diabetic Rats. Int J Endocrinol Metab 2013;1;11(4):e10927. 11. Al-Rasheed NM, Al-Rasheed NM, Attia HA, Hasan IH, Al-Amin M, Al-Ajmi H, Mohamad RA. Adverse cardiac responses to alpha-lipoic acid in a rat-diabetic model: possible mechanisms?. J Physiol Biochem 2013;69(4):761-78. 12. Tekin N, Akyüz F, Temel HE. NO levels in diabetes mellitus: Effects of l-NAME and insulin on LCAT, Na(+)/K(+) ATPase activity and lipid profile. Diabetes Metab Syndr 2011;5(4):191-5. 13. Gahr, M. Isoelectric focusing of hexokinase and glucose-6-phosphate dehydrogenase isoenzymes in erythrocytes of newborn infants and adults. Br J Haematol 1980;46(4), 529–535. 14.Beutler E, Blume KG, Kaplan JC, Löhr GW, Ramot B, Valentine WN. International Committee for Standardization in Haematology : Recommended Methods for Red-Cell Enzyme Analysis. Br J Haematol 1977; 35(2): 331–340. 15. Kingsley FGR. The direct biuret method for the determination of serum proteins as applied to photoelectric and visual colorimetry. J Lab Clin Med 27:840-845, 1942. 16. Yılmaz S, Karahan D, Kandemir FM. Effects of Some Nitrosamines on Pyruvate Kinase Activity in Tissues of Rats. Fırat Üniv Sağ Bil Derg 2008;22(3):163–168. 17. Matteucci C, Cocci FF, Pellegrini L, Gregori G, Giampietro O. Measurment of ATPases in red cells: setting up and validation of a highly reproduciple method. Enz Protein 1995;48:115–9. 18. Schweitzer JB, Smith RM, Jarett L. Differences in organizational structure of insülin receptor on rat adipocyte and liver plasma membranes: Role of disulfide bonds. Proc Natl Acad Sci USA 1980;77(8):4692-4696. 19. Anetor JI, Uche CZ, Ayita EB, Adedapo SK, Adeleye JO, Anetor GO, Akinlade SK. Cadmium Level, Glycemic Control, and Indices of Renal Function in Treated Type II Diabetics: Implications for Polluted Environments. Front Public Health 2016;13;4:114. 20. Schmatz R, Perreira LB, Stefanello N, Mazzanti C, Spanevello R, Gutierres J, Bagatini M, Martins CC, Abdalla FH, Daci da Silva Serres J, Zanini D, Vieira JM, Cardoso AM, Schetinger MR, Morsch VM. Effects of resveratrol on biomarkers of oxidative stress and on the activity of delta aminolevulinic acid dehydratase in liver and kidney of streptozotocin-induced diabetic rats. Biochimie 2012;94(2):374-83. 21. Valera A, Rodriguez-Gil JE, Bosch F. Vanadate treatment restores the expression of genes for key enzymes in the glucose and ketonebodies metabolism in the liver of diabetic rats. J Clin Invest 1993;92(1):4-11. 22. Edwards JR, Prozialeck WC. Cadmium, Diabetes and Chronic Kidney Disease. Toxicol Appl Pharmacol 2009; 238(3): 289-93. 23. Gill TS, Pant JC. Cadmium toxicity: Inducement of changes in blood and tissue metabolites in fish. Toxicol Lett 1983;18(3):195-200. 24. Ithakissios DS, Ghafghazi T, Mennear JH, Kessler WV. Effect of multiple doses of cadmium on glucose metabolism and insulin secretion in the rat. Toxicol Appl Pharmacol 1975;31(1):143-149. 25. Sastry KV, Shukla V. Acute and chronic toxic effects of cadmium on some haematological, biochemical, and enzymological parameters in the fresh water teleost fish Channa punctatus, Acta Hydrochimica Et hydrobiologica 1994;22(4):171-176. 26. Winiarska K, Malinska D, Szymanski K, Dudziak M, Bryla J. Lipoic acid ameliorates oxidative stress and renal injury in alloxan diabetic rabbits, Biochimie 2008;90(3):450-459. 27. Scaramuzza A, Giani E, Redaelli F, Ungheri S, Macedoni M, Giudici V, Bosetti A, Ferrari M, Zuccotti GV. Alpha-Lipoic Acid and Antioxidant Diet Help to Improve Endothelial Dysfunction in Adolescents with Type 1 Diabetes: A Pilot Trial. J Diabetes Res 2015;2015:474561. 28. Yang Y, Li W, Liu Y, Li Y, Gao L, Zhao JJ. Alpha-lipoic acid attenuates insulin resistance and improves glucose metabolism in high fat diet-fed mice. Acta Pharmacol Sin 2014;35(10):1285-92. 29. Anuradha B, Varalakshmi P. Activities of glucose-metabolizing enzymes in experimental neurotoxic models with lipoate as an alleviator, J Appl Toxicol 1999;19(6):405–409. 30. Maritim AC, Sanders RA, Watkins JB. Effects of α-lipoic acid on biomarkers of oxidative stress in streptozotocin-induced diabetic rats, J Nutr Biochem 2003;14(5):288–294. 31. Manna P, Das J, Ghosh J, Sil CP. Contribution of type 1 diabetes to rat liver dysfunction and cellular damage via activation of NOS, PARP, IκBα/NF-κB, MAPKs, and mitochondria-dependent pathways: Prophylactic role of arjunolic acid, Free Radic Biol Med 2010;48(11):1465-1484. 32. Periyar Selvam Sellamuthu, Balu Periamallipatti Muniappan, Sathiya Moorthi Perumal, Murugesan Kandasamy. Antihyperglycemic effect of mangiferin in streptozotocin induced diabetic rat. Journal of Health Science 2009;55(2):206-214. 33. Amalan V, Vijayakumar N, Indumathi D, Ramakrishnan A. Antidiabetic and antihyperlipidemic activity of p-coumaric acid in diabetic rats, role of pancreatic GLUT 2: In vivo approach. Biomed Pharmacother 2016;84:230-236. 34. Mirtaheri E, Gargari BH, Kolahi S, Asghari-Jafarabadi MA, Hajaliloo M. Effect of Alpha-lipoic Acid Supplementation on Serum Lipid Profile in Women with Rheumatoid Arthritis. Nutr Food Sci Res 2014;1(1): 11-18. 35. Kandasamy N, Ashokkumar N. Reno protective effect of myricetin restrains dyslipidemia andrenal mesangial cell proliferation by the suppression of sterol regulatory element binding proteins in an experimental model of diabetic nephropathy. Eur J Pharmacol 2014; 15;743:53-62. 36. Yargıçoğlu P, Agar A, Edremitlioğlu M, Kara C. The effects of cadmium and experimental diabetes on vep spectral data and lipid peroxidation. Int J Neurosci 1998;93(1-2):63-74. 37. Liu M, Song X, Zhang J, Zhang C, Gao Z, Li S, Jing H, Ren Z, Wang S, Jia L. Protective effects on liver, kidney and pancreas of enzymatic- and acidic-hydrolysis of polysaccharides by spent mushroom compost (Hypsizigus marmoreu). Sci Rep 2017; 24;7:43212. 38. Cao Z, Fang Y, Lu Y, Tan D, Du C, Li Y, Ma Q, Yu J, Chen M, Zhou C, Pei L, Zhang L, Ran H, He M, Yu Z, Zhou Z. Melatonin alleviates cadmium-induced liver injury by inhibiting the TXNIP-NLRP3 inflammasome. J Pineal Res 2017;62(3). 39. Sadek KM, Saleh EA, Nasr SM. Molecular hepatoprotective effects of lipoic acid against carbon tetrachloride-induced liver fibrosis in rats: Hepatoprotection at molecular level. Hum Exp Toxicol. 2018;37(2):142-154. 40. Srinivasan S, Sathish G, Jayanthi M, Muthukumaran J, Muruganathan U, Ramachandran V. Ameliorating effect of eugenol on hyperglycemia by attenuating the key enzymes of glucose metabolism in streptozotocin-induced diabetic rats. Mol Cell Biochem 2014;385(1-2):159-68. 41. Stanley Mainzen Prince P, Kamalakkannan N. Rutin Improves Glucose Homeostasis in Streptozotocin Diabetic Tissues by Altering Glycolytic and Gluconeogenic Enzymes. J Biochem Mol Toxicol 2006;20(2):96-102.42. Rana S, Sing, R, Verma S. Protective effects of few antioxidants on liver function in rats treated with cadmium and mercury. Indian J Exp Biol 1996;34(2):177-179. 43. Rathi SS, Grover JK, Vats V. The effect of Momordica charantia and Mucuna Pruriens in experimental diabetes and their effect on key metabolic enzymes involved in carbohydrate metabolism, Phytother Res 2002;16(3):236-243. 44. Salas M, Viñuela, E, Sols A. Insulin-dependent synthesis of liver glucokinase in the rat, J Biol Chem 1963;238(11):3535- 3538. 45. Newairy, A. A., El-Sharaky, A. S., Badreldeen, M. M., Eweda, S. M., Sheweita, S. A. The hepatoprotective effects of selenium against cadmium toxicity in rats. Toxicology 2007;242, (1-3), 23–30. 46. Dailianis S, Kaloyianni M. Cadmium induces both pyruvate kinase and Na+/H+ exchanger activity through protein kinase C mediated signal transduction, in isolated digestive gland cells of Mytilus galloprovincialis (L.). J Exp Biol 2004;207(10):1665-1674. 47. Sacan O, Turkyilmaz IB, Bayrak BB, Mutlu O, Akev N, Yanardag R. Zinc supplementation ameliorates glycoprotein components and oxidative stress changes in the lung of streptozotocin diabetic rats. Biometals 2016;29(2):239-48. 48. Vague P, Coste TC, Jannot MF, Raccah D, Tsimaratos M. C-peptide, Na+,K+-ATPase, and Diabetes. Exp Diabesity Res 2004;5(1):37-50. 49. Oubaassine R, Weckering M, Kessler L, Breidert M, Roegel JC, Eftekhari P. Insulin interacts directly with Na+/K+ATPase and protects from digoxin toxicity. Toxicology 2012; 4;299(1):1-9. 50. Fehlmann M, Freychet P. Insulin and glucagon stimulation of (Na+-K+)-ATPase transport activity in isolated rat hepatocytes. J Biol Chem 1981;256(14):7449-53.